I’ve become pretty obsessed with mushrooms. I’m afraid I’m becoming like my father. It’s not that mushrooms are his thing; he has an appreciation for them, but fungi are not his speciality. I come home with bags of mushrooms and spread them out of the table for inspection and identification, and processing, if they’re edible. Sometimes I don’t get to all of them in one night and they sit around, cluttering our eating space. I wonder if it bugs my roommates. I feel like a mad and chaotic scientist. I am my own mycologist. That’s how I remind myself of my father. He’s a hobby geologist and fills my parents’ home with rocks. Rocks all over his desk. Rocks all over the deck. Rocks on the fireplace mantle. Rocks on the side tables on either end of the couch. There would be rocks in the kitchen and on the dining table if my mother would let him. I am limited by the shelf life of wet mushrooms. It’s both a blessing and a curse that mushrooms don’t last as long as rocks. On one hand, I have an extremely limited time to study them. (They’re usually pretty gross after 24 hrs.) On the other, it prevents a build up of material. When I’m finished with the mushrooms, or when they’re finished with me and get limp and rotten, I throw them into the side yard. They decompose quickly enough. And I unrealistically hope that the spores from the mushrooms will become new mushrooms. But my barely existent yard is an unlikely habitat for most fungi. And it can take years for a decent mycelium to develop and fruit. 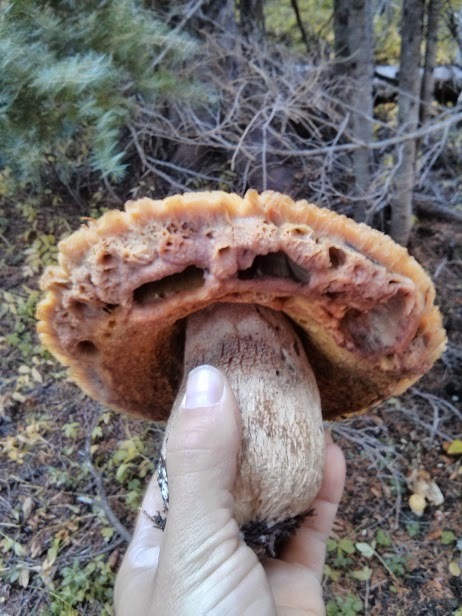 A photo Eric took of a yucky old bolete. This weekend, I went hunting for boletes. Boletes are fairly typical looking mushrooms except that they have a spongey underside instead of gills. Many boletes are delicious but, although there are no known fatal boletes, a few are poisonous and can make people pretty sick. We were after the most prized of boletes, the king bolete, the porcini, Boletus edulis. Unfortunately, an early snow fall the week before had destroyed the integrity of the sensitive mushrooms. The freezing and unthawing made them mushy. On our way back, I punted a large dead, mushy mushroom in rage. Eric and I only took home one king bolete and our searching partners found an additional one. We did also find and eat an admirable bolete (lemony! ), a few pounds of bear’s head (a bit bland but nice texture for soup), and some surprise matsutakes. There’s a great article from the NYT about hunting for matsutakes. The article talks about seeking them in sandy soil, but the ground was pretty ashy where we were. I was expecting them to be harder to find, but Eric found some popping out of the soil where we stopped for lunch. Eric has been turning them into the perfect miso soup. Mushroom Expert– This website has a really good identification guide. Cascade Mycological Society– They are kind enough to have an online forum that is open to the public with tips on mushroom hunting that posted by fellow fungi fans. Mushroom Observer– Mushroom nerds log observations of mushrooms in the wild. Searching can be difficult and you have to know the scientific name, but it’s an opportunity to look at many pictures of the same species to help you see several specimens from a variety of angles and get an idea of where it’s showing up. Gorgeous! I’m jealous of your ID-ing abilities/bravery. The only edible mushroom I know on site is the Black Trumpet, which is delicious. If you know the black trumpet, it probably shouldn’t be too hard to figure out the rest of the chanterelles. I recommend starting with the pocket guide All the Rain Promises and More.